Yes, the second half our trip to Hong Kong started out on the highest of high notes, and it just got better from there. How, you ask? Two words, my friends. Dim. Sum. Bam! Miraculously, all parties involved in LKF the night before were fine the next morning. At least, Sean, David and I were… When we met in Times Square to go for a brunch of dim sum(! ), we recapped the antics of the night before, David related what happened to Kai (and how he’d disappeared in the wee hours of the morning) and that he hoped he was okay (luckily Kai called during dim sum and was fine, if hung over). 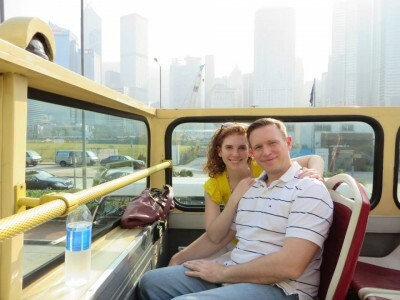 Sean and I ready to get educated about Hong Kong courtesy of the Big Bus Tour narrator. We went to a traditional dim sum restaurant David recommended called Jade Garden in Causeway Bay, and it was a perfect choice. There wasn’t a single other Westerner in the restaurant the entire time we were there, and the food was spectacular – the best dim sum I’ve had yet. And we got a little bit of everything: BBQ pork buns, BBQ pork, shrimpshumai, noodles in peanut sauce, flat rice noodles, pineapple custard buns, mango pudding and more. It’s safe to say all three of us could have been rolled out of the restaurant when were done. A view of Aberdeen from our bus tour. But instead of settling into the food coma as you might expect, we got back on the Big Bus Tour, which David joined us for that day, and saw more of Hong Kong. 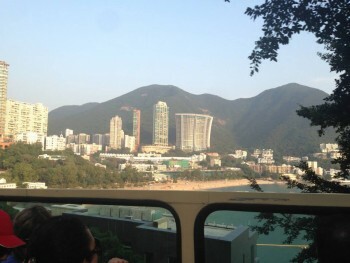 We were taken to Repulse Bay on the south side of island and saw the beautifulbeachside high rises of Aberdeen and Stanley, then back through the higher tiers of the central part of Hong Kong. One last ride on the Star Ferry back across the Harbor toTST, and we were on the last bus route seeing things likeMongKok and Ladies’ Night Market, Nathan Road, the Peninsula Hotel (still famous for its fleet of RollsRoyces and high tea each afternoon) and the tallest building in Hong Kong: the International Financial Center. Wow! 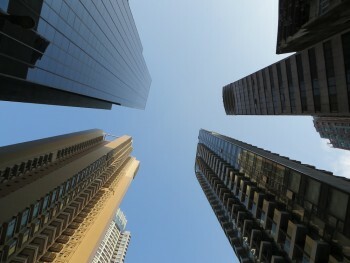 Imagine seeing this everyday living in Hong Kong. Wow! For a finale to the trip, Sean and I met a friend of mine, Rob, who’s a pilot for Cathay Pacific and happened to be flying into Hong Kong the night before we were due to depart. I met him the last time I was there during my semester abroad, and it was a stroke of good luck that our travel dates happened to overlap once again. Rob suggested a number of good restaurants I’d love to try in the future, but in the end he made a reservation at a trendy little restaurant in Wan Chai named, Stone Nullah Tavern. Great choice – on a street with almost no other discerning features this little restaurant stood alone as a gem, and featured unique American, comfort-style food the likes of which I hadn’t seen since the States. Naturally, my eyes were bigger than my stomach, so I boldly suggested we order the BBQ set menu – the waitress told us it was for four, but we were confident we three could handle it. We made a good go of it, but in the end I think the BBQ platterwon (I knew it had won when the giant slab of pork shoulder came out after the full-sized meatloaf burgers, chips, fried artichokes, salad and pickled veggies had already been presented). It was a wonderful way to cap off everything we’d done up to that point though. We said good night to Rob, who was also done in after his long flight across the seas and took the MTR one last time back to our side of the island. It was a sad moment for me. Once more, Sean and I were up before the sun to get back to the Hong Kong Airport for a short flight to Narita Airport in Tokyo, a two-hour layover and the final thirteen-hour slog home to the US. It was a whirlwind trip back to Asia, but I’m just as certain as I was the last time: Hong Kong is still one of my favorite places on Earth. Here’s to the next time Asia – I can’t wait to see you again soon. 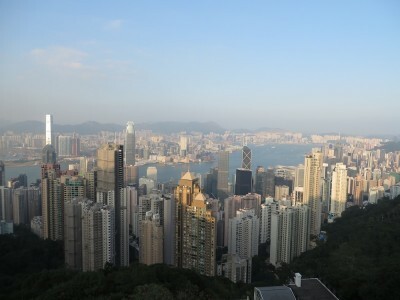 The city of Hong Kong from the top of Victoria Peak. Again, we were so lucky to have such clear weather when we went to the top. This entry was posted in Asia, Hong Kong and tagged Asia, Dim Sum, Hong Kong, Mong Kok, MTR, Travels, Wan Chai on July 9, 2014 by Paige N..